Despite the two-hour drive from Charleston, pitmaster Rodney Scott’s eponymous barbecue joint in Hemingway, S.C. has long been considered a must-try for foodies and ‘cue enthusiasts. With coverage in everything from The New York Times to Anthony Bourdain’s Parts Unknown, the Scott family business is now something of a destination unto itself. But those without the time or fossil fuels can now put that gas money where their mouth is. Scott has opened a second titular location in the former Chick’s Fry House on King Street. Unlike the Hemingway original — situated in a cramped, quaint blue house — the new digs are roomy and generic, with plenty of natural light and ample seating. As the falsetto groove of the Bee Gees “More Than a Woman” played overhead, I dug into my ‘bag of skins’ ($5) while I waited. Seated at the community table in the center of the restaurant, a neighbor must have overheard the crunching. “Are those chicharones?” he whispered excitedly. Indeed, they are. Crisp and light, yet full of fatty flavor, the pork rinds are dusted with a mild paprika-based seasoning and undoubtedly worth the Abraham Lincoln they command. 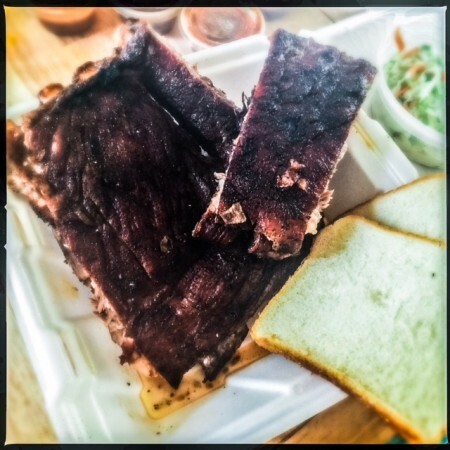 When the food arrived, the spare ribs (whole/$20, half/$12) possessed a hard outer layer, but moist, fatty meat inside. With a smoke ring clear to the bone, the woodsy goodness permeates every bite. Still, the drier sections border on jerky and demand sauce. There’s a choice between Rodney sauce — a vinegar-based, mop-type sauce with a strong cayenne finish. Those with delicate palates should note it packs some heat, while the other sauce is a sweeter, thicker, tomato-enriched variation. Anyone who knows anything about the legend of the Hemingway location knows that the Scott family has been cooking whole hog barbecue over hardwood coals since the early 1970s. The same process is in place here, and the large pits are continually manned in a caged area behind the restaurant. Scott himself is often on the premises, so it’s a little perplexing why the whole hog pulled pork ($14/pound, $9-$14 for sandwiches and plates) suffers from the same bark-like coating. Consistently inconsistent and varying between tender shreds and leather-like chunks, the swine comes dressed in a light layer of spicy Rodney sauce. Although providing some much-needed juiciness, there’s an inevitable cayenne kick to each bite. If you or your stomach can’t take the heat, the gorgeous pulled smoked chicken ($14/pound or $14 for a whole chicken) might be more up your alley. Tender and succulent, with a pervasive smoke flavor, the yard bird was by far the best of the smoked meats I tried. 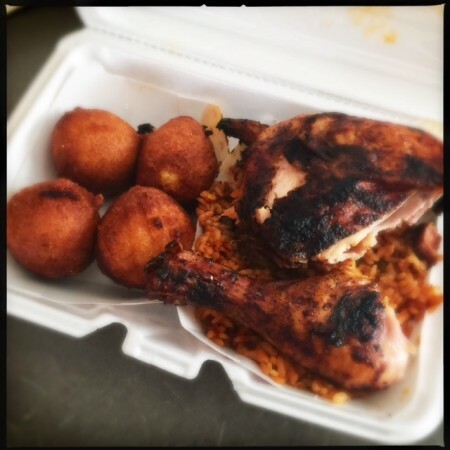 If you’re looking for a little variation, a thigh and drumstick combo come with the chicken perloo ($13), the jambalaya-esque rice dish made with Andouille sausage, celery, and red bell pepper. Oily and a little spicy, the perloo is also available as a side dish ($3/$6/$9) and is one of the better ones. Less so the grits ($3/$6/$9), which seem to have been prepared with salty chicken broth and quickly harden to a gelatinous solid. Muddy in appearance and reminiscent of firm polenta in taste and texture, these could use a little work. One thing that should absolutely not be changed — in any way — are the greens ($3/$6/$9). Tender, savory, sour, and (of course) a little bit spicy, most collards can only hope to achieve such glory in their afterlife. Vegetarians need not apply, however, as there are large chunks of pork throughout. 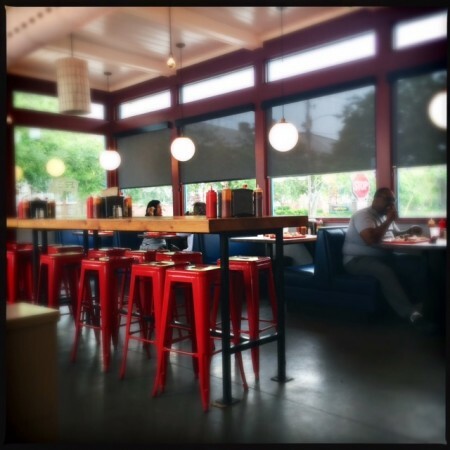 The counter staff at the bright, airy new restaurant is perpetually friendly and helpful. With upbeat music from the late ’70s and early ’80s playing both inside and out, there’s a contagious cheerful vibe in the air. Scott has added some additional offerings to the Charleston menu, and the rib-eye sandwich ($11.50 with one side) is unexpectedly pleasing. Assembled on a potato roll and topped with ripe tomato slices and wilted and utterly unnecessary iceberg lettuce, the thin-sliced rib-eye is generously layered and covered in melty American cheese and grilled onions. Something of a Southern cheesesteak, it’s a good option for anyone not in the mood for more traditional barbecue. So is the fried catfish ($8.50-$14), which is honestly outstanding. 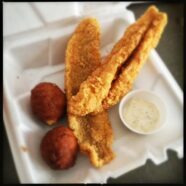 I know, I know: You didn’t come to Rodney Scott’s BBQ where “it’s all wood” to eat something out of the deep fryer, but you really should consider it. “This can’t be catfish,” moaned my mother, her mouth full of catfish. A lifelong catfish hater — she lavished equal-opportunity loathing on them dead or alive — she pretty much demolished the plate in the first five minutes. Perhaps owing to the modern wonders of farm-raised fish, the strong, muddy flavors of wild-caught catfish are (blessedly) over. Rather, the sweet, mild flesh is coated in a perfectly crisp cornmeal breading. Other sides available with a plate include the baked beans ($3/$6/$9). Made with bell peppers, they are otherwise quite traditional — sweet and thick, with a little kick at the end. Same goes for the coleslaw ($3/$6/$9), which also features thin bits of green bell peppers in an otherwise traditional light mayo sauce. Although the shoestring fries ($3/$6/$9) were lukewarm both times I visited, it didn’t get in the way of the flavor. Tiny and crisp, they’re seasoned with salt and pepper. If you catch them right out of the fryer, they’re probably magnificent. Last up, the golf ball-sized hush puppies are essentially savory donuts. With a crisp exterior and soft, mealy middle dotted with tiny bits of fresh onion, they’re a solid effort as far as hush puppies go. Overall, and quite surprisingly, the best dishes from the new Rodney Scott’s BBQ were the smoked chicken and fried catfish. So what’s happened to the legendary whole hog magic? Probably nothing. In actuality, the Hemingway location boasts some secret ingredients — namely Scott’s mother, oldest son, and other long-time employees — and it will evidently take a little bit for the pitmaster and this new crew to tweak things just so. 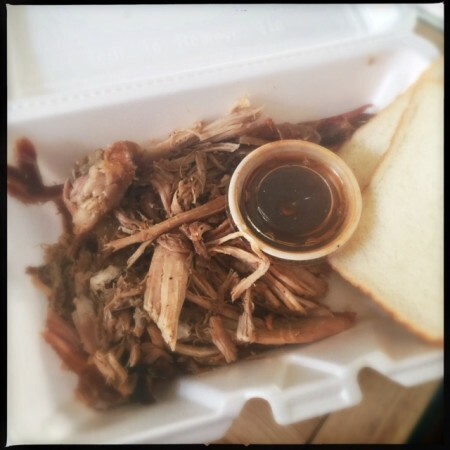 Yes, there’s room to improve, but considering the near-mythological status preceding Rodney Scott’s BBQ, there’s every reason to believe it’ll get there.